About 8 months ago, while struggling with a double-wide stroller on the '22' bus every Tuesday and Thursday morning, I met a lovely girl who would lift seats for me, help me maneuver the giant contraption and chat to the girls while I sorted myself out (it usually took me awhile to find my bus pass). We chatted about living abroad, our eerily similar husbands to be and reassured each other about our lack of wedding preparedness. 8 months on, we are both married (despite neither of us being that good at things like....sending out invitations on time), I am much more stroller/bus savvy, we have developed a knitting style all our own (as in, we make it up and she tries measuring the circumference of her neck with a knitting needle while I apparently knit with two different size needles every now and then, and neither of us are that sure how to read a pattern). We have seen male strippers, while knitting/eating chocolate/drinking beer/killing ourselves laughing/covering our eyes at the back of the pub. We have trained as doulas together, talked birth, breastfeeding, parenting, baby wearing and reassured each other yet again about our 'crazy hippy' attitudes surrounding it. 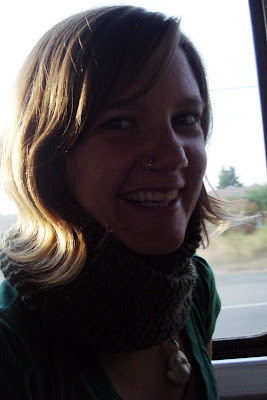 Thank you for being my first Vancouver friend, Girl-from-the-bus. Have a wonderful birthday, know that you are loved, eat lots of treats and find those granny boots. I love you, you are awesome. I'm all teary eyed, so I will give you a hug in person and try to be more eloquent. The best friends are made in ramdom places!